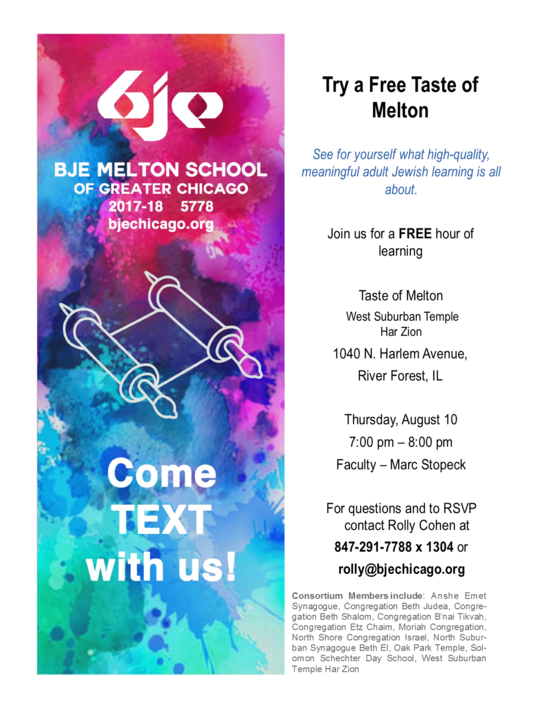 If you have ever wondered what it would look like to take the next step in your Jewish education and journey, you should consider the Melton program that we will be hosting, beginning this Fall. It is an amazing opportunity to do engaging in-depth Jewish learning with people you care about. It will enrich and inspire your Jewish life and take you to the next level of Jewish literacy. We also have a fund for scholarships so that this cohort can include all those who would like to participate. The program has earned very high praise from all of our members who have participated in the past. If you want to find out more, join us this Thursday at 7 p.m. for a 'Taste of Melton'. Classes begin in the fall on Thursdays beginning November 9th.